The Atomic Marine Rib Carpet Tile is our high quality loop pile bitumen back carpet collection.Ideal for commercial areas i.e shops, office and all areas of the home.Ideal for high traffic areas.A heavy duty carpet tile Easy to maintain.Require no underlay.The tile sizes are 50cm x 50cm each - coming in boxes of 20, covering a 5 Metre Squared area per box.These tiles are only available as boxes of 20. *3 BOXES REMAINING AS OF 22/11/18*Specifications:Name: AtomicCol.. The Brazilian Carpet Tile is our high quality loop pile bitumen back carpet collection.Ideal for commercial areas i.e shops, office and all areas of the home.Ideal for high traffic areas.A heavy duty carpet tile Easy to maintain.Require no underlay.The tile sizes are 50cm x 50cm each - coming in boxes of 20, covering a 5 Metre Squared area per box.These tiles are only available as boxes of 20. **ONLY 4 BOXES REMAINING**Specifications:Name: BrazilianColour: SkyThickness: .. The Columbian Emerald Green Rib Carpet Tile is our high quality loop pile bitumen back carpet collection.Ideal for commercial areas i.e shops, office and all areas of the home.Ideal for high traffic areas.A heavy duty carpet tile Easy to maintain.Require no underlay.The tile sizes are 50cm x 50cm each - coming in boxes of 20, covering a 5 Square Metres area per box.These tiles are only available as boxes of 20. *5 BOXES REMAINING AS OF 22/11/18*Specifications:Name: Colu.. The Crosshatch Beige Carpet Tile is our high quality loop pile bitumen back carpet collection.Ideal for commercial areas i.e shops, office and all areas of the home.Ideal for high traffic areas.A heavy duty carpet tile Easy to maintain.Require no underlay.The tile sizes are 50cm x 50cm each - coming in boxes of 20, covering a 5 Metre Squared area per box.These tiles are only available as boxes of 20. *14 BOXES REMAINING AS OF 22/11/18*Specifications:Name: Crosshatc.. The Dyelot Blue Rib Carpet Tile is our high quality loop pile bitumen back carpet collection.Ideal for commercial areas i.e shops, office and all areas of the home.Ideal for high traffic areas.A heavy duty carpet tile Easy to maintain.Require no underlay.The tile sizes are 50cm x 50cm each - coming in boxes of 20, covering a 5 Metre Squared area per box.These tiles are only available as boxes of 20. *3 BOXES REMAINING AS OF 22/11/18*Specifications:Name: Dyelot.. The Electric Blue Rib Carpet Tile is our high quality loop pile bitumen back carpet collection.Ideal for commercial areas i.e shops, office and all areas of the home.Ideal for high traffic areas.A heavy duty carpet tile Easy to maintain.Require no underlay.The tile sizes are 50cm x 50cm each - coming in boxes of 20, covering a 5 Metre Squared area per box.These tiles are only available as boxes of 20.SpecificationsName: ElectricColour: BlueThickness: 5mmMaterial: 100% P.. The French Rose Rib Carpet Tile is our high quality loop pile bitumen back carpet collection.Ideal for commercial areas i.e shops, office and all areas of the home.Ideal for high traffic areas.A heavy duty carpet tile Easy to maintain.Require no underlay.The tile sizes are 50cm x 50cm each - coming in boxes of 20, covering a 5 Metre Squared area per box.These tiles are only available as boxes of 20. *2 BOXES REMAINING AS OF 22/11/18*Specifications:Name: French.. The Giggleswick Gold Carpet Tile is our high quality loop pile bitumen back carpet collection.Ideal for commercial areas i.e shops, office and all areas of the home.Ideal for high traffic areas.A heavy duty carpet tile Easy to maintain.Require no underlay.The tile sizes are 50cm x 50cm each - coming in boxes of 20, covering a 5 Metre Squared area per box.These tiles are only available as boxes of 20.Specifications:Name: GiggleswickColour: GoldThickness: 5mmMaterial.. The Haileybury Carpet Tile is our high quality loop pile bitumen back carpet collection.Ideal for commercial areas i.e shops, office and all areas of the home.Ideal for high traffic areas.A heavy duty carpet tile Easy to maintain.Require no underlay.The tile sizes are 50cm x 50cm each - coming in boxes of 20, covering a 5 Metre Squared area per box.These tiles are only available as boxes of 20. *9 BOXES REMAINING AS OF 22/11/18*Specifications:Name: HaileyburyC.. The Icelandic Sea Blue Rib Carpet Tile is our high quality loop pile bitumen back carpet collection.Ideal for commercial areas i.e shops, office and all areas of the home.Ideal for high traffic areas.A heavy duty carpet tile Easy to maintain.Require no underlay.The tile sizes are 50cm x 50cm each - coming in boxes of 20, covering a 5 Metre Squared area per box.These tiles are only available as boxes of 20. *5 BOXES REMAINING AS OF 22/11/18*SpecificationsName: .. The Natural Charm Carpet Tile is our high quality loop pile bitumen back carpet collection.Ideal for commercial areas i.e shops, office and all areas of the home.Ideal for high traffic areas.A heavy duty carpet tile Easy to maintain.Require no underlay.The tile sizes are 50cm x 50cm each - coming in boxes of 20, covering a 5 Metre Squared area per box.These tiles are only available as boxes of 20. *1 BOX REMAINING AS OF 22/11/18*Specifications:Name: Natural Ch.. The Swedish Rib Carpet Tile is our high quality loop pile bitumen back carpet collection.Ideal for commercial areas i.e shops, office and all areas of the home.Ideal for high traffic areas.A heavy duty carpet tile Easy to maintain.Require no underlay.The tile sizes are 50cm x 50cm each - coming in boxes of 20, covering a 5 Metre Squared area per box.These tiles are only available as boxes of 20. *3 BOXES REMAINING AS OF 22/11/18*Specifications:Name: SwedishCol.. The Ukrainian Orange Carpet Tile is our high quality loop pile bitumen back carpet collection.Ideal for commercial areas i.e shops, office and all areas of the home.Ideal for high traffic areas.A heavy duty carpet tile Easy to maintain.Require no underlay.The tile sizes are 50cm x 50cm each - coming in boxes of 20, covering a 5 Metre Squared area per box.These tiles are only available as boxes of 20.Specifications:Name: UkrainianColour: OrangeThickness: 5mmMaterial.. 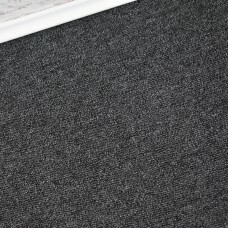 The Vienna Anthracite Loop Carpet Tile is our new high quality loop pile Poly Flex backed carpet collection.Ideal for commercial areas i.e shops, office and all areas of the home.Ideal for high traffic areas.A heavy duty carpet tile Easy to maintain.Require no underlay.The tile sizes are 50cm x 50cm each - coming in boxes of 20, covering a 5 Metre Squared area per box.Available as Full Box (5SQM) or Part Box (2.5SQM) - £9.99 Per SQM.Specifications:Name: ViennaColou.. 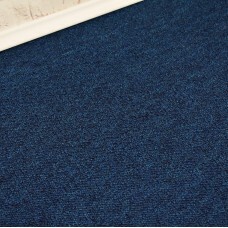 The Vienna Blue Loop Carpet Tile is our new high quality loop pile Poly Flex backed carpet collection.Ideal for commercial areas i.e shops, office and all areas of the home.Ideal for high traffic areas.A heavy duty carpet tile Easy to maintain.Require no underlay.The tile sizes are 50cm x 50cm each - coming in boxes of 20, covering a 5 Metre Squared area per box.Available as Full Box (5SQM) or Part Box (2.5SQM) - £9.99 Per SQM.Specifications:Name: ViennaColour: Dark Blu..